3. Gold Pass - Rs.500 entitles participation to all activities as per eligibility. Round Table India (Noida) is hosting a Kid’s carnival for the first time in Noida, wherein kids from all over Delhi-NCR will participate in the numerous events. This event aims at raising awareness and competitive spirit among children through the medium of races and sports activities. KIDATHON is one of the biggest kids’ carnivals that is being held every year in Chennai. 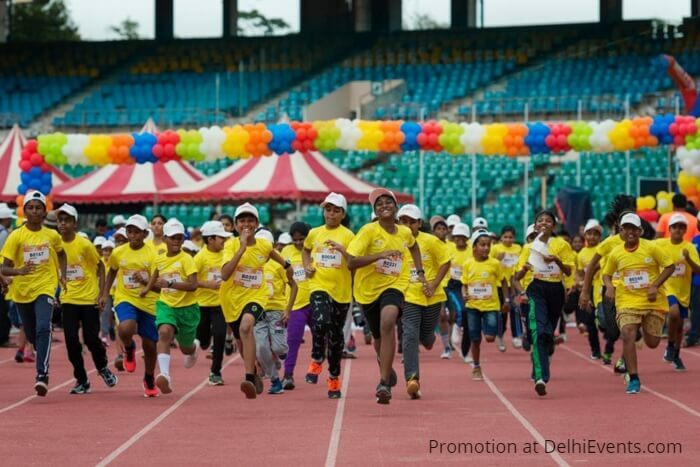 The latest edition has witnessed the 7500 + visitors including kids, parents and friends participating enthusiastically in the event which is much more than a race. The primary goal to organise such an event is to encourage the spirit of fitness and good health of kids. As conscious individuals, we need to make our children more conscious about their physical and mental well being and generate awareness about the importance of physical fitness. This has become more important as we live in a digital age of PUBG and Counterstrike. This event has been successfully conducted by Round Table India in Chennai for the last five years and will be launching in Delhi NCR. The event will have various activities for kids and parents including 100 meters to 2000 meters’ race, Batin Relay Race, Standing Broad Jump, Sack Race, Hoop Race, Hurdles Race, 3 Legged Race, Wheel Barrow Race, Cone Race, Balloon Race, 800 meters’ parents combined race, Fashion Show etc.